Nissan’s all-new NP300 Navara ute/pickup range is finally complete with the workhorse leaf-sprung Single Cab and King Cab models now on-sale. That means Nissan Navara is available in 27 variants – the most Nissan’s credentialed load-lugger has offered. Nissan has a hunch traditional buyers of workhorse leaf-sprung Navaras – the likes of tradies, couriers, miners and farmers - may now look at the entire lineup and opt for those with independent rear suspension offering a more supple ride. Since its launch in June, all-new Nissan NP300 Navara Dual Cab has racked-up more than 5,000 sales and is Nissan Australia’s best-selling individual model - but Nissan dealers report many customers have been waiting to evaluate the leaf-spring models. Some 95 per-cent of Nissan Navaras sold are powered by one of the diesel engines and that preference is clear with the full lineup now revealed. Significantly the entry-level DX Single Cab cab chassis 4x2 petrol model is priced at $19,490 – inside the Federal Government’s $20,000 small business incentive threshold. The new Single Cab and King Cab Nissan Navara versions mirror the Dual Cab lineup – entry-level DX, mid-grade RX, upscale ST and range-topping ST-X. Single cab models are exclusively cab chassis – there is no pick-up body available (appropriate for their workhorse life). Hang in there because this gets complicated. Nissan’s QR25DE 2.5-litre petrol engine is exclusive to the entry-level DX Single Cab 2WD model. Very much a vehicle for couriers, the four-cylinder petrol engine delivers 122kW of power ay 6000rpm and peak torque of 238Nm at 4000rpm. The YS23DDT 2.3-litre single turbocharged diesel engine is available in DX 4x4, RX 4x2 and 4x4 (Single and Kin g Cab). With 120kW of power at 3750rpm and peak torque of 403Nm from 1500-2500rpm it’s more than handy. But the star of the show is without doubt the YS23DDTT 2.3-litre twin-turbocharged diesel powering King Cab ST 4x4 and King Cab ST-X 4x4. It’s a beast with 140kW of power at 3750rpm and peak torque of 450Nm from 1500-2500rpm. Nissan Navara employs either a six-speed manual or seven-speed automatic transmission. As per the Dual Cab models, the NP300 Nissan Navara is like no other Navara before it in terms of interior design and creature comforts. Some would say Navara has come from ‘zero’ to ‘hero’. Of course the range-topping ST-X with satellite navigation, leather, heated front seats and lumbar support leads the way. But we actually think when you factor-in value for money, the ST might steal the show (it misses-out on the leather and nav basically but still gets all the connectivity and five-inch colour display. Could make for some robust discussions between driver and the company car manager at purchase time! But across the range we’re talking nice design, classy materials, space and comfort. For practicality the King Cab models with rear-opening doors and fold-down rear seats might make a sensible choice for many fleet buyers. As we said when we first encountered the Dual Cab models, the NP300 is a powerful design. With its sculptured bonnet and rather aggressive front-end, the NP300 instantly erases some earlier rather dowdy earlier Navara styling jobs. This time around we were rather taken by the King Cab models with their disguised rear doors appearing the give extra length to the wheelbase. We tackled the familiar roads from Albury to Victoria’s high country in a variety of Single Cab, King Cab, ute and cab chassis versions of the all-new Nissan Navara. Rally ace Cody Crocker mapped-out the drive route so not surprisingly we enjoyed some tremendous and at times high-speed dirt roads along the way. And the efficiency of Navara’s ABS, EBD and brake assist meant we missed the sleepy echidna perambulating along the middle of one of those dirt roads! Nice day for a stroll little fella – and sorry about the dust!! Of course the star in the Navara specification sheet is that mighty twin-turbocharged diesel engine. The effortless torque delivery (450Nm from 1500-2500rpm remember) and sweet ratios for the six-speed manual transmission certainly made for an easy gallop over the mountains. Nissan had Navaras loaded with cargo and unladen for us to try. Compared to the previous D40 model Navara the new NP300 Single Cab and King Cab models run leaf springs which are shorter and lighter and a rubber mounting block – this impressively addresses the Achilles Heel of leaf springs utes which is the ride when empty. The single-turbo diesel is no laggard with 403Nm but jumping into it from the twin-turbo model on the high country mountain roads you did notice it working harder over the climbs and twists. In fact, so good are Nissan Navara’s diesel duo that you could be forgiven for thinking the 2.5-litre petrol engine was poor relation. Of course this may be the engine of choice for city-based buyers like couriers and they will find it perfectly admirable for their needs. Regardless of the engine or body type, the all-new Nissan Navara was impressively refined over those roads around Albury. Nice isolation of engine and road noise and hardly any wind noise proved how much progress Nissan has made form the previous generation. Nissan should have lead the trend and made the reversing camera standard across the range. We knew from the Double Cab models that the all-Nissan Navara was a winner so it’s no surprise the Single Cab and King Cab models are equally impressive. 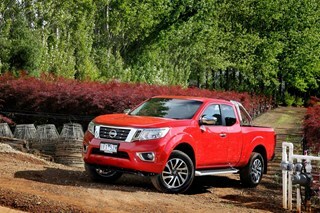 With the Navara its top-selling nameplate, Nissan Australia had to ensure nothing was left to chance. ‘Capable’ is the word which springs to mind when wrapping-up the all-new Nissan Navara. These workhorse Single Cab and King Cab models hit the sweet spot for the intended market. And those buyers – many of them commercial fleets - will focus on ‘home runs’ like the 3.5-tonne towing capacity, payload capacity up to 1,362kgs and OH&S credentials like seven airbags including a drivers’ knee bag. As we said, Nissan ticked all the boxes. In this ‘Year Of The Ute’ (upgraded Ford Ranger, Mazda BT50and all-new Mitsubishi Triton and Toyota Hi-Lux) the handsome, nice to drive and feature-rich Nissan Navara range is a standout. If you rushed-in and bought one of the rival models because you didn’t have the patience for the equivalent Navara to arrive…well, sorry about that. Here’s the challenge facing Nissan Navara: Ford Ranger, Mazda BT50, Mitsubishi Triton and Toyota Hi-Lux. All are either brand new or updated this year. And Isuzu D-MAX is a must=consider for any buyer in this league. Specifications across the spectrum are enormous and there’s no shortcuts for buyers…get those spreadsheets ready. Our snapshot sees the Ranger/BT50 leading the field for driving dynamics but on the crucial capability front it’s hard to separate any of the big names.